Nikki Bella has set the record straight regarding her current relationship with John Cena. As you surely know, in April 2018, the WWE star and the Ferdinand actor revealed they had pulled the plug on their six year relationship and scheduled wedding. However, thanks to E! 's docu-series Total Bellas, fans witnessed a reunion between Bella and Cena and were left confused about the status of their relationship. While Total Bellas currently shows a back-together Nikki and John, the former flames are not an item at this time. Nikki made this point abundantly clear in a YouTube video posted on Sunday, July 1. "I'll admit my relationship has been in a super emotional rollercoaster ride. I think it's hard for people to understand. We film, and I think things get shown months after," Nikki explained in her upload. "I think people are like 'Are they together? Are they not?' and because I am a reality star, and I have a reality show…I feel like I have to say what is the update on John and I. Right now, we are just friends. We are both working on each other and trying to work on us." 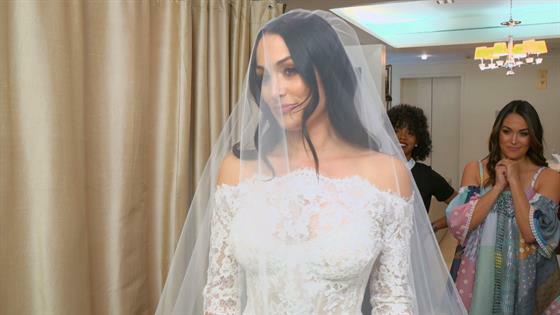 Watch Nikki Bella Find the "Stunning" Wedding Dress of Her Dreams on Total Bellas: "I Just Got Goosebumps!" Nonetheless, it seems that the duo's love story may not be over for good as the Bella twin still has "hope" for her and John. "We talk every day. He is not only my best friend, but he truly is one of the most amazing people I have ever met," the reality TV veteran continued. "He has patience with me and has really taught me a lot over the past few months. I think one of those things is the inner strength that I thought I had but didn't realize how strong I had it." Per Nikki, John is off filming a movie in China, which has given them the "time in life to see what we really want for the future." Understandably, Brie Bella's sister wants to be one hundred percent certain about what she wants before tying the knot. "I don't want to be someone who has a divorce. Or who has kids and then gets a divorce," the Total Bellas star relayed. "Like I truly want to walk down that aisle. I want to give my vows and I want this to be one time. There were a lot of issues that I had to deal with and really know what I wanted for the rest of my life. I am beyond grateful that I have this amazing man who is staying by my side and helping me fight through those issues. And helping me become and even better person and even stronger." Ultimately, John and Nikki just want "each other to be very, very happy" and "hopefully" a permanent reunion is in the cards. Still the upcoming Total Bellas episodes will be "very tough" for Nikki to re-live. "The season finale is very tough. It's very honest, raw and real and you will see why John and I are at where we are at today," Nikki concluded. "That John Cena, I will tell you, he is one of the most amazing men that has ever walked this earth. There is no one with a bigger heart, a stronger heart and more giving to anyone in this world. I am very lucky to be his best friend and in the end if I don't in the end become his wife, I am very lucky to have shared the past six years of my life with this person." For everything Nikki had to spill on her split, be sure to watch the video above!